Windy Ridge, caravan club site Ivybridge Ugborough South Hams Devon, directions. The site is easily accessible from the A38 also known as the Devon Expressway. From the A38, the campsite is signposted with Windy Ridge signs. On the A38 heading towards Plymouth from Exeter, take the Wrangaton Exit signposted Ivybridge Train Station Park + Ride. At the top of the slip road turn left onto the A3121 signposted for Ugborough, Modbury and Kingsbridge. Take the 3rd right at Venn Cross signposted Ugborough, Ermington. Continue on this road for 3 further crossings straight ahead. Windy Ridge is 300 meters on the right hand side after the last crossing(Toby Cross). 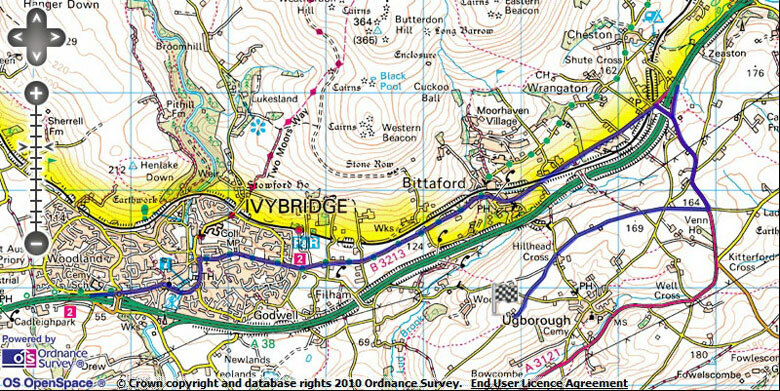 Coming from Plymouth on the A38, take the Ivybridge junction and follow the signs for Bittaford and Exeter to Wrangaton. Turn right signposted Kingsbridge, Modbury and Ugborough over the A38 and pickup signs and directions from above. When using the postcode, most navigators and route planners will take you to Hill Head Cross. From Hillhead Cross, proceed towards Ermington to Toby Cross. Windy Ridge is 300 meters on the right hand side after Toby Cross.